The King’s College, NEW YORK – New art on campus caused a buzz among students ever since the first day of the semester and various interpretations abound of the 25 pieces. The collection by Wayne Adams is on loan to King’s through June 2017. A majority of the pieces hang in the fifth floor Executive Suite, although several pieces hang in the lobby and the City Room. Adams is a Brooklyn-based artist and President of the Board of Christians in the Visual Arts, an organization dedicated to encouraging visual arts in the Church. Adams attended Calvin College for his B.F.A. and Washington University in St. Louis for his M.F.A. Previously, he exhibited his work in multiple cities across America as well as in Vienna, Austria. King’s Presidential Scholar Dan Siedell followed Adams' work for over 10 years and Siedell’s class visited Adam’s studio in Brooklyn. Many students find Adams’ work comical and sometimes jarring. The most noticeable of these pieces is "Sheep and Goat Hug It Out" -- a large canvas in the back of the City Room displaying a spray-painted sheep and goat hugging each other. Narbe is not alone in finding the art off-putting. Michael Martinez ('18), said that, “I really am confused by the furry one," in regard to "Silver Void," hanging outside Eric Bennett’s office. However, both students agree that they do enjoy parts of Adams work. “I think the sheep and goat one is cute,” Narbe stated. 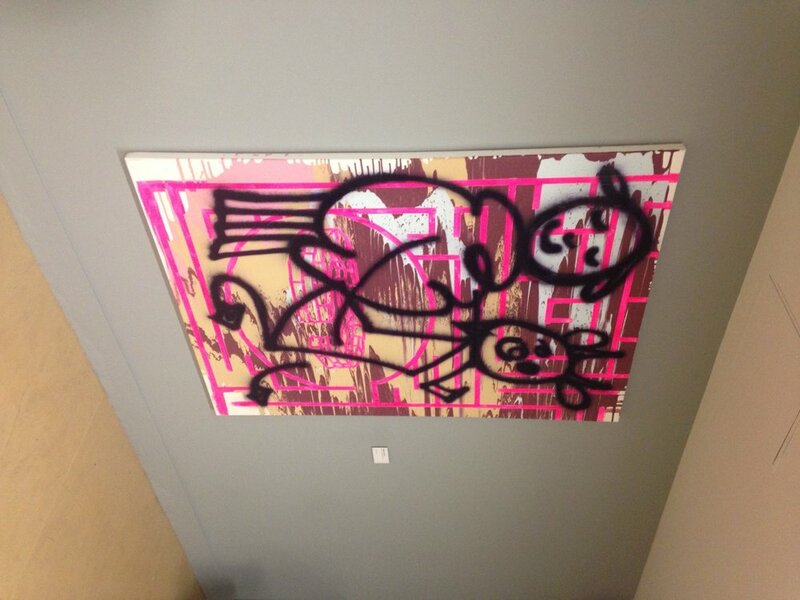 “I really like the piece in the City Room," Martinez added. Professor Siedell offered a helpful perspective. In a similar vein, Dr. Bleattler also thinks "Sheep and Goat Hug It Out" is meant to evoke a chorus of reactions, especially comedy. He believes students should think critically about "why they think what they think about" the art. Junior MCA Major Hannah Gulledge likewise argued that Adams’s art deserves more consideration. Whether or not students appreciate Adams’s work, it is clear that Adams’s work evokes strong reactions. “I think the art isn’t cohesive with the campus vibe. But at the end of the day, why not? It starts some conversation. I think it’s good," Martinez added.